There are so many dogs out there just like Ethel. The barren field was packed with dozens of sickly, mange-ridden dogs. The old mattresses and couches that littered the lot were their only sleeping spots. Some dogs stood hunched over a giant bowl of cornmeal, their backs red and hairless from skin infections. In the distance, a pack of large dogs chasing each other trampled something tiny straight to the ground. 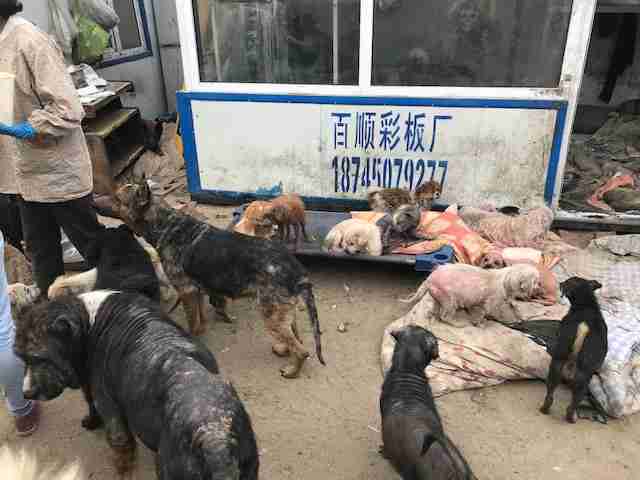 This was the scene rescuer Odessa Gunn witnessed on April 28 while accompanying Slaughterhouse Survivors to a facility in Harbin, China, that’s run by a Buddhist group that saves dogs from meat trucks that are en route to slaughterhouses. The Buddhist group is often the last line of defense before the dogs are killed for food — but due to a lack of funds and resources, the overrun rescue often has to surrender the animals it saves to other organizations like Slaughterhouse Survivors. After seeing the large dogs topple right over Ethel, Gunn rushed over to the tiny Chihuahua’s side. 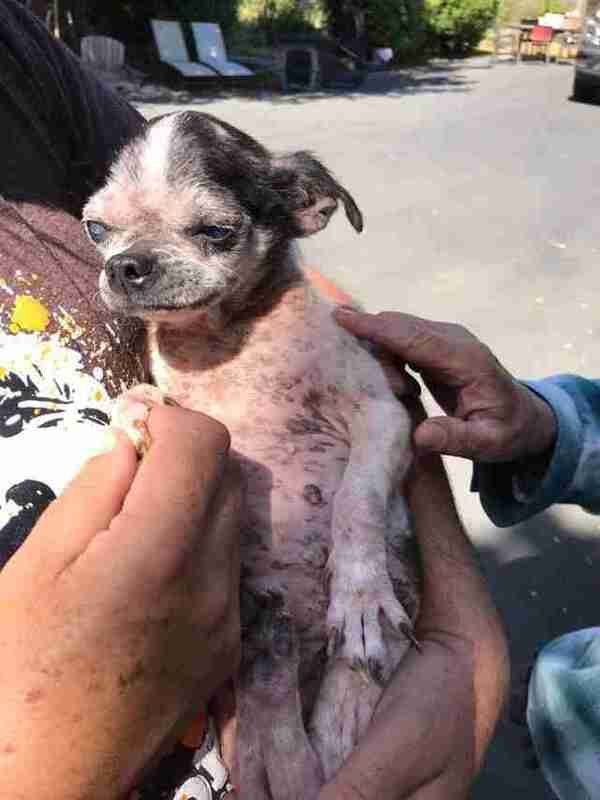 The tiny senior Chihuahua was covered in mange and barely had any hair. 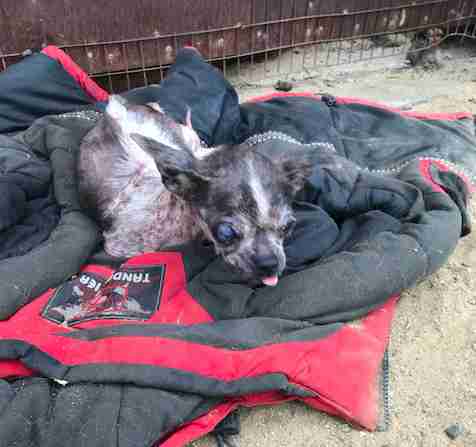 She was weak from only being fed cornmeal and looked to be completely blind. One of her rear legs was clearly injured, as she refused to walk on it. 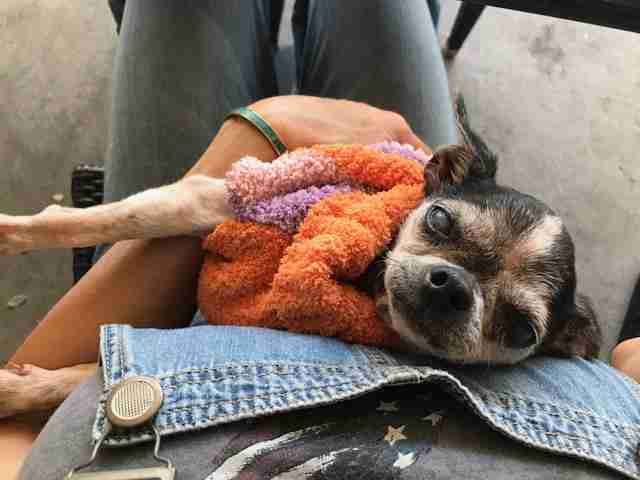 While it’s unclear where Ethel lived before ending up on the meat truck, Gunn said it’s likely she was either stolen from her owner’s yard, or abandoned and picked up on the street. 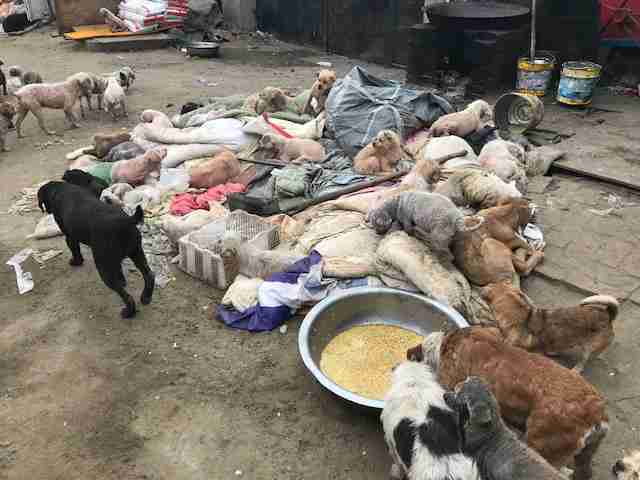 In China, where over 10 million dogs are slaughtered for food each year, it’s very common for dog farm owners to pay drivers to round up pet or stray dogs. Then, they are either brought to the dog farm or sent directly to the slaughterhouse to be killed. While many larger breeds, like Jindos, hounds or golden retrievers, are commonly killed for meat, small dogs are not exempt from the same cruelties. Once Gunn took Ethel from the Buddhist rescue group, she got her to a vet clinic right away. 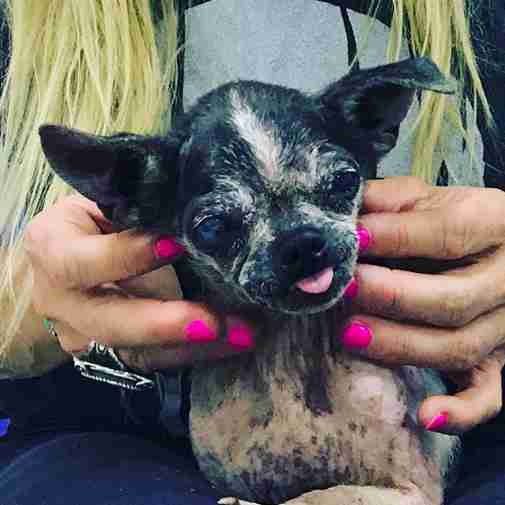 Although Ethel was in horrible shape, she started feeling so much better after eating some proper food and getting a bath to soothe her irritated skin. After a month of care, she was healthy enough to fly to her new home with Gunn in California. 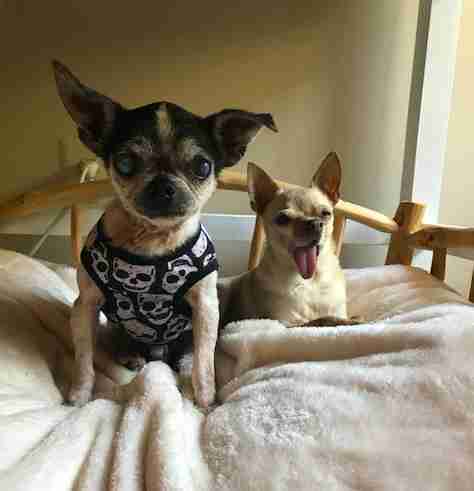 Gunn’s other dogs welcomed Ethel into their home with open paws. One pup in particular, Jose, has especially taken a liking to her — and it’s not hard to see why. 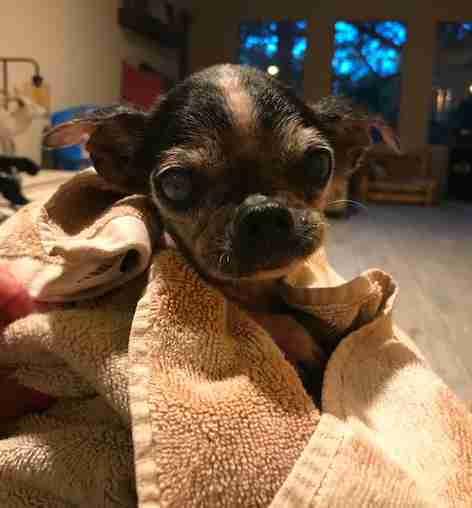 Luckily, Ethel’s mange is no longer contagious, but she is still recovering, and receives daily medicated baths and antibiotics to ward off infection. With the help of Compassion Without Borders (CWB), which Gunn regularly volunteers with, Ethel will be getting all the veterinary care she needs to live a healthy life. 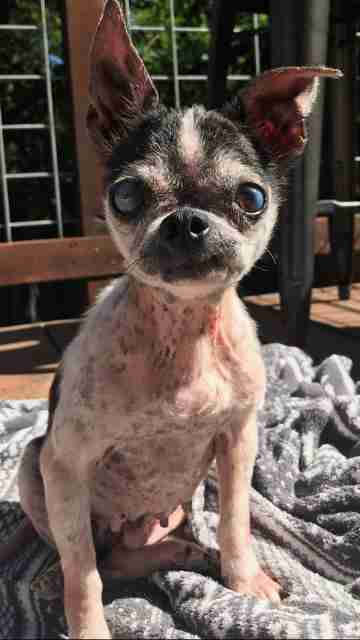 While Ethel appeared to be totally blind at the time of rescue, Camblor believes she still has limited vision in one of her eyes. They’ll bring her to the eye doctor in the coming weeks to learn how she can be helped. Until then, Ethel is learning from her foster siblings just how pampered she deserves to be. It’s not official yet, but Gunn is already thinking of making little Ethel a permanent member of the family. 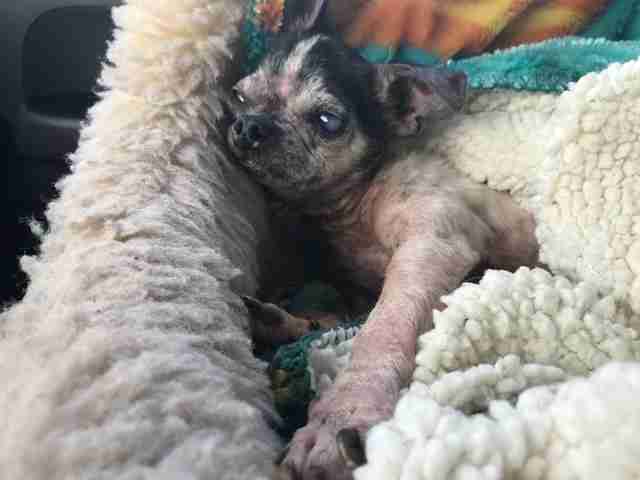 And after everything she has been through, it’s clear Ethel would love to stay there. To help cover Ethel’s medical care, you can make a donation to Compassion Without Borders. To keep up with Ethel's journey, you can follow her on Gunn's Instagram.